The Foldable Kitchen Cart is a great design that saves space when not in use. Features a shelf, castors, and built in knife board with handle and is easily moved around. The open cart dimension is 37.8"W x 17.2"D x 34.6"H. When folded the cart is 36.8"W x 5.1"D x 34.6"H. Top surface of the cart is 33.6"W x 17.2"D and has a shelf clearance of 14.2". Made from solid wood in light oak finish. 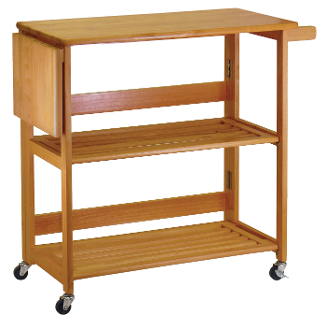 The open cart dimension is 37.8"W x 17.2"D x 34.6"H. Top surface area is 33.6"W x 17.2"D.
Cart Folded size is 36.8"W x 5.1"D x 34.6"H with a shelf clearance of 14.2".